I am always on the look out for good middle grade reading material for my students. 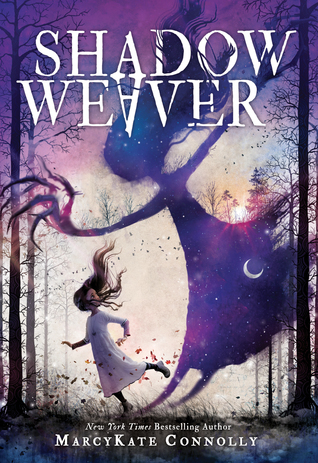 When I saw Shadow Weaver on Netgalley, I fell in love with the cover. Look how spooky it is! The claws on the shadow grabbed my attention right away. I don't know about you, but my students LOVE a good spooky read, so I decided to check this out. I felt that the pacing was a bit awkward in a few places because it seemed to lull then rocket forward, but overall it was easy to breeze through the pages to see what would happen next. Most chapters ended with great cliff hangers that made you want to keep going, so that will be a plus for younger readers. The plot is pretty solid as well. Lonely girl feels like an outcast, discovers that her only "friend" isn't much of a friend, takes advice from a really bad influence out of desperation and a sense of loyalty (plus having too good of a heart for her own good), meets new friend, makes a few poor choices but redeems herself in the end, and then finds herself in a big mess that needs fixing. Obviously, there is a bunch of fun magical things occurring in between, but that's the gist of it. Emmeline is a little bit gullible and too trusting, which made her a perfect protagonist. How many young readers find themselves with those character traits? It's not that she was dense or anything; it's just that she's been sheltered for various reasons and hasn't had a chance to really experience the world. That lack of experience adds a lot to the plot of the story as Emmeline has to learn to stand on her own and think for herself. As a subtle theme running throughout the novel, I could easily pick out examples of true friendship and accepting yourself as Emmeline, Dar, and Lucas navigate this magical world. There was also a pretty solid plot twist at the end that I think was great! Such a surprise and it will make young readers want to keep reading the series so they can find out what happens next. The writing style was accessible and not too difficult. Some parts might be confusing or too wordy in the descriptions, but I think it's manageable for all reading levels. Having short chapters and lots of action will help keep readers interested.